Africa GeographicDestinationsBotswanaResearch: Are there too many elephants in Botswana? Elephants: the majestic gentle giants of the African savannah. Their enormous intelligence and close family bonds fascinate safari goers and scientists alike. Whilst strolling through the bush, they shovel masses of grass into their mouths, and occasionally bump into the odd tree – effortlessly breaking large branches and even pushing the whole thing over. Elephants are awesome creatures, and even lions keep a respectful distance from these megaherbivores. All of the unique characteristics that put elephants at the top of the must-see list for many international visitors also serve to create controversy and management headaches among conservationists. These giants need gigantic amounts of space and natural resources – at one point in history this was not a problem, as all of Africa except the Sahara was available to them. Today’s remnant populations have been constricted to relatively small areas, which are often fenced and managed by humans. Their food requirements, however, have not changed – they need to eat anywhere between 140 and 490 kg of plant matter every single day! Additionally, they are highly dependent on water, and each bull elephant will drink up to 120 litres per day. In short, the impact of elephants does not go unnoticed in the African savannah. Certainly, the effects of Botswana’s 130,000 pachyderms are easy to see from just a cursory glance at the landscape. Broken and uprooted trees are the most obvious signs of elephants, but they also eat huge amounts of grass and other small plants (called forbs). Whilst elephants mainly eat grass and forbs in the wet summer season, they rely on trees (leaves, bark, roots) to get them through the dry winter season. 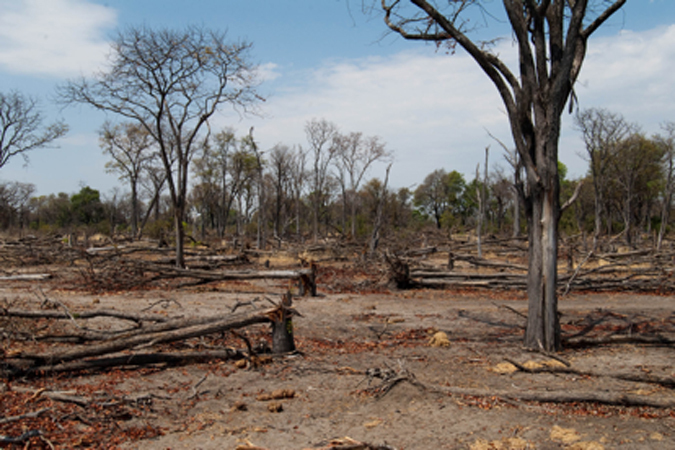 Trees are therefore most vulnerable to being de-barked and uprooted in the late dry season. These facts leave us in no doubt about the enormous impacts that elephants have in any ecosystem where they occur. Although Botswana’s elephant population is not overly restricted by fences (as are those in many of southern Africa’s protected areas), they seem to concentrate in northern Botswana. In particular, huge herds of elephants congregate by the Chobe River during the dry season – a spectacular sight for tourists, but a cause for concern among ecologists. The question that many ask is: Are there too many elephants in Botswana? This question, however, begs another more critical question – how do we know how many is too many? This latter question is subject to enormous debate within southern Africa, which focuses on the ecological carrying capacity of certain National Parks for elephants. Carrying capacity is often seen as a ‘golden number’ of elephants, beyond which they begin to overuse the local ecosystem, thus damaging it and negatively affecting other species. On the other side of the debate, some point out that whilst elephants seem to cause enormous destruction in the immediate vicinity of waterholes, this does not necessarily mean that they are destroying the entire ecosystem. These debates are far from merely academic. If those warning that there are too many elephants for ecosystems to support are right, then something needs to be done before the damage becomes irreparable. What that ‘something’ entails, however, is often too terrible for most elephant-loving people to consider. The large-scale elephant culling operations suggested by some are not a popular solution, unsurprisingly. Other options, like translocation and contraception are more palatable, but too expensive to be used on large elephant populations. In particular, the sheer size of Botswana’s elephant population means that none of these solutions is currently practical – including culling. However, some commentators warn of catastrophic consequences for all species if nothing is done, and soon. Avoiding emotionally charged debates based on little more than informed opinion, researchers from Botswana decided to tackle the critical elephant question head-on. 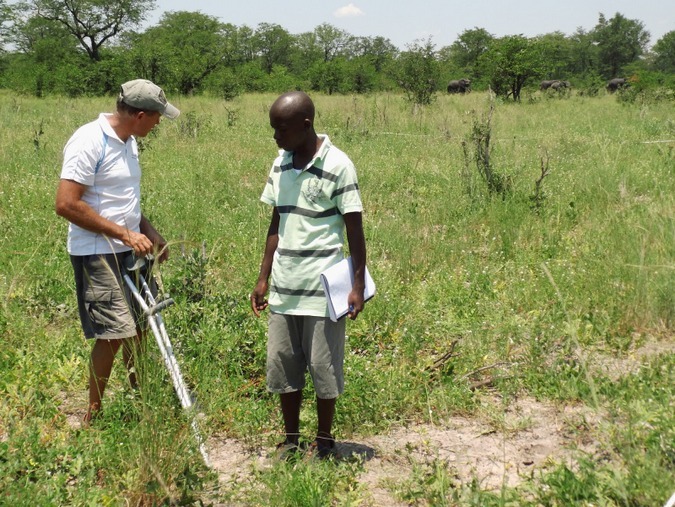 Dr. Keoikantse Sianga and Dr. Richard Fynn of the Okavango Research Institute (a specialised department of the University of Botswana) joined forces with three Dutch researchers from Wageningen University in a vegetation study focusing on a large natural area called the Savuti-Mababe-Linyanti Ecosystem. This enormous area of nearly 30,000 square kilometres lies between the Okavango Delta, the Mababe Depression and the Linyanti Swamps, and therefore hosts a healthy proportion of Botswana’s elephants. 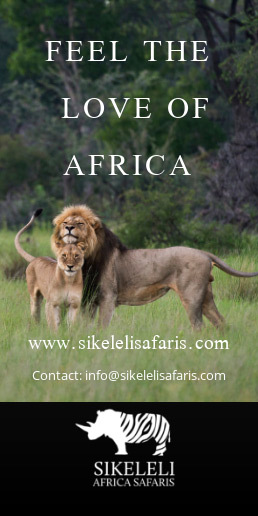 They chose this particular area as it is almost untouched by human management efforts, unlike most other locations in southern Africa. Only one pan is artificially pumped to maintain water throughout the dry season in their entire study area, and there are no fences within the area to inhibit elephant movement. They could therefore ask: in the virtual absence of human interference, are there too many elephants for this ecosystem to support? Additionally, this important work reveals how elephants naturally affect their habitat, thus providing a baseline to compare with other areas that are heavily managed. Whilst not resolving the elephant debate, this scientific knowledge can help wildlife managers in southern Africa to better understand the problem and consequently make better decisions to resolve it. Rather than trying to calculate the ‘golden number’ of elephants that can be supported by the ecosystem, the research team sought to answer the underlying question – is the current elephant population is actually damaging the ecosystem? They viewed ecosystem health as its ‘heterogeneity’, which is an indication of how many different habitats are available for different species (known as ecological niches). A heterogeneous ecosystem has many different species of trees and grass, all growing to different heights. Some grazing herbivores prefer tall grass, whereas others prefer short grass; some bird species prefer dense shrubs to live and nest in, whereas others prefer tall trees. Consequently, to support a large variety of animals, you need a variety of different habitats, which can be measured directly by looking at the plants. If the plants in the Savuti-Mababe-Linyanti ecosystem were all the same species, or all the same height, it would indicate a serious problem. Something (e.g. elephants) would be ‘homogenising’ the ecosystem; i.e. reducing the number of habitats available for other species. If, however, the system is still heterogeneous (i.e. containing many plant species of different heights), then it can still harbour a good diversity of species. Understanding elephant behaviour and biology helped the team develop a suitable way to test how elephants are influencing the ecosystem. Although elephants can traverse great distances if they want to, they are highly dependent on water and must drink daily. During the wet season, water dependence is not an issue, as temporary natural pans fill up with water, thus allowing many elephants to move away from permanent water sources and use most of the ecosystem. However, in the dry season these pans dry up, and elephants have to stay close enough to rivers and permanent lakes to return to them on a daily basis. The average distance that bull elephants will stray from water in a day in search of food is around 15 kilometres, whereas herds of females and their young ones will only go as far as 5 kilometres. Consequently, the largest elephant impact will be found less than 5 km from permanent water, with less impact in the 5-15 km zone, and minimal impact over 20 km from water (only accessible to elephants during the wet season). 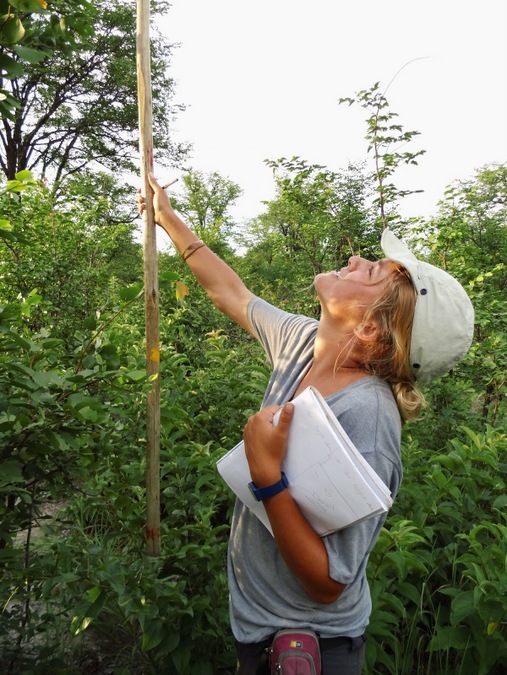 The research team investigated the species diversity and plant height of trees, grasses, and forbs in each of these three zones on four different routes through their study area. They also counted the dung of elephants and other herbivores to find out how much these places were visited by herbivores. Finally, they obtained fire records for the last 15 years to ensure that the effects of fire could be separated from the effects of elephants and other herbivores. Their results revealed that, rather than irreparably damaging the ecosystem, elephants actually help maintain heterogeneity by improving grass and forb species richness in the zone closest to permanent water. These grasses were kept short through year-round grazing by elephants and other herbivores. 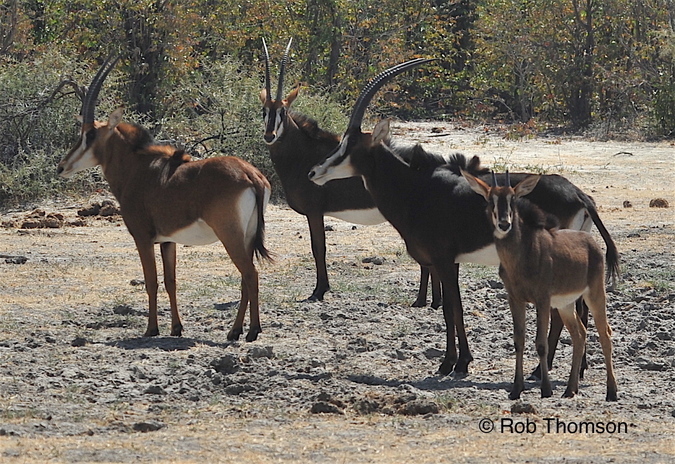 In contrast, the zone furthest from water was dominated by high-quality long grasses, which are preferred by species such as sable and roan antelope. These results were found in the vegetation type known as sandveld, which is especially important for grazers, as it supports a rich diversity of grass species. Similarly, trees were taller in the zones far from water than in the zone less than 5 km from water. During the dry season, elephants use trees more heavily and it is therefore not surprising that the trees closest to permanent water are frequently broken and thus kept in a shortened state. 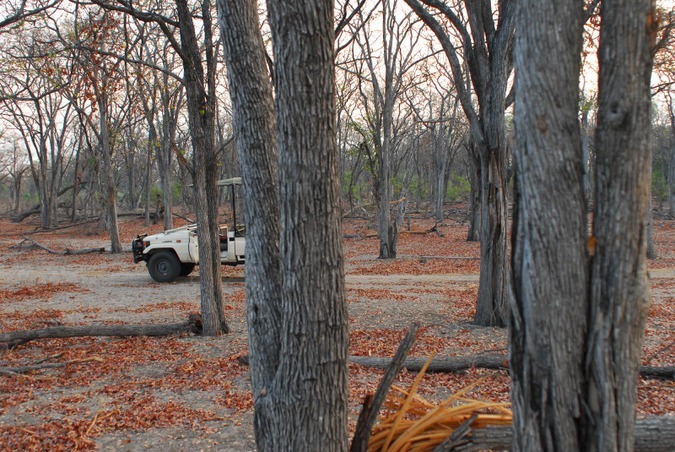 They found this trend for the two most common tree species in the ecosystem – mopane and Terminalia sericea (silver cluster leaf). Although short, stumpy shrubs look less attractive to us than tall trees, it is important that ecosystems contain both shrubs and trees. The researchers concluded that the large population of elephants in northern Botswana perform a key ecological role by maintaining heterogeneity in the ecosystem. There is, however, one important caveat to this conclusion: this system can continue to sustain large elephant numbers only as long as there are large distances (at least 50 km) between permanent water sources. The fact that young elephants cannot walk as far as adults between food and water is one of the key natural ways of preventing elephant populations from growing too large. In long dry seasons, adult females are forced to move further away from water to find food, and this may mean that some calves do not survive the dry season. They therefore warn against developing new waterholes in this ecosystem for two reasons. Firstly, the impacts of large elephant herds all year every year would soon turn the whole area into short grass and shrubs with little species diversity, to the detriment of other animals that prefer long grass and trees. Secondly, providing permanent waterholes would remove one of the few natural mechanisms for limiting elephant numbers. These warnings are not idle, as they build on harsh lessons learned in other places. It is also about more than just elephants. Studies in the Kruger National Park show that when waterholes were developed throughout the park (such that the average distance to water in the dry season was a mere 6 km), the habitat for sable and roan shrank, as water-dependent grazers (e.g. zebra and buffalo) moved in to previously waterless regions. The ultimate result was a tragic population crash of both species, and very few can be found in the Kruger today. Predators like lions are also favoured by increasing waterholes, as many of their preferred prey species are water dependent. Although this sounds great for tourism, larger lion populations may have contributed to the crash of roan and sable, and are likely to reduce the number of African wild dogs. These are just two examples of the unintended negative consequences of artificial waterholes. Northern Botswana currently hosts healthy populations of roan, sable, and African wild dogs. Lessons learned from the Kruger should therefore provide major pause for thought before developing waterholes in this region. 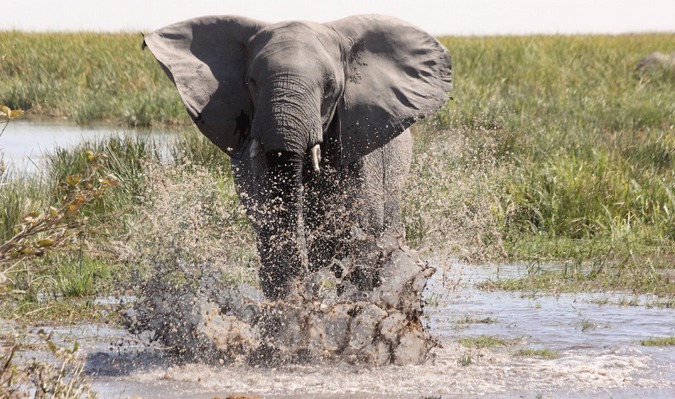 The researchers point out that fencing that restricts elephant movements during the wet season is also likely to increase pressure on the ecosystem. Rather than allowing the short grasslands near permanent water to rest during the dry season, the megaherbivores (elephants and buffalo) are forced to use these grasses heavily throughout the year, rather than migrating to other areas. Artificial waterholes and barriers to elephant movement (such as fences) are thus ultimate causes of ecosystem damage, rather than the elephants themselves, which simply respond to the available resources. Simply removing many elephants will not solve the underlying problem, so the population will keep rebounding and there will be an endless battle for the health of the ecosystem. For the moment, the Savuti-Mababe-Linyanti Ecosystem remains intact. However, the researchers recommend that this area should be carefully monitored, and that pumping new waterholes should be tightly regulated. 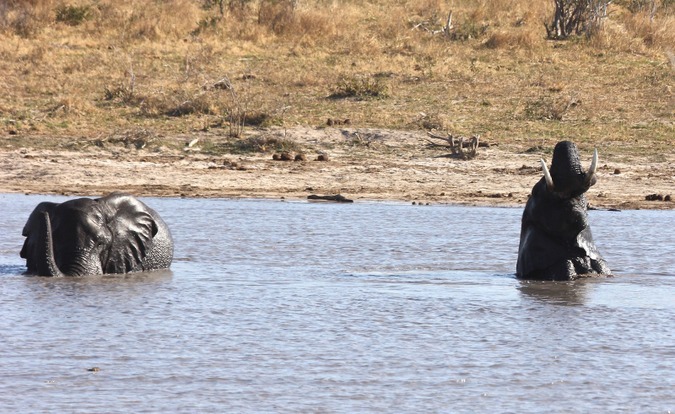 Furthermore, the prevalence of current waterholes in the Chobe Region (east of their study area) and threats to elephants beyond Botswana’s borders that restrict elephants to northern Botswana are key issues that need to be addressed. Allowing elephants to move freely over large, unfenced areas is a regional challenge that needs to be discussed between Botswana and neighbouring countries. Perhaps it is time the debate around elephants evolves from carrying capacity numbers and elephant management to ecosystem health and landscape management.